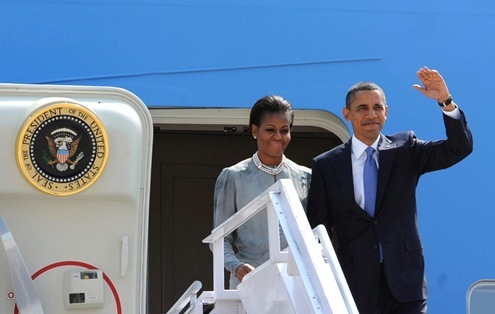 The U.S. President Barack Obama and the First Lady Michelle Obama arrived at Mumbai airport on November 06 by Air Force One aircraft on three days visit to India. By deciding to visit Mumbai first and further deciding to stay at the Taj Mahal Palace (as Hotel Taj Mahal was one of the targets of attack by the sea-borne terrorists on November 26, 2008 at Mumbai), the President has strengthened the Indo-US fight against terrorism. The President reached INS Shikra by Marine One, Marine Helicopter Squadron One (HMX-1) to reach Hotel Taj Mahal by road. The President Barack Obama and the First Lady Michelle Obama arriving at Chhatrapati Shivaji International Airport, Mumbai by Air Force One. 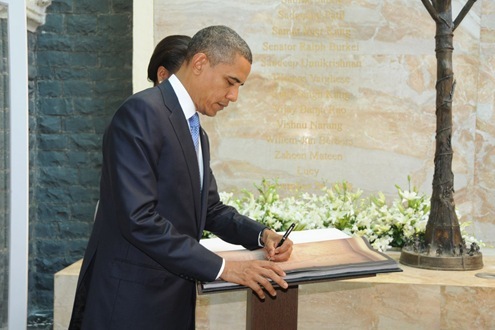 The President Barack Obama signing the visitor’s book after paying tributes, at the memorial for victims of 26/11 sea-borne terror attacks, at Hotel Taj Mahal, in Mumbai. The President Barack Obama and the First Lady Michelle Obama meeting the families of victims of 26/11 sea-borne terror attacks, at Hotel Taj Mahal, in Mumbai. Security: even coconuts were removed from the coconut trees to avoid unexpected fall on the U.S President during his stay in India. Cost: the controversy regarding expenses of $200 million per day and deployment of 34 U.S. Navy warships for the trip are denied by The White House Blog. HMX-1 was formed in December 1947 to test and evaluate helicopters and tactics. HMX-1 was used for the first time in 1957 to ferry President Dwight D. Eisenhower from Newport, Rhode Island to return to the White House on short notice (he flew the first portion of the trip aboard HMX-1). HMX-1 gives all helicopter transportation to the President (both overseas and within the continental United States). The primary presidential helicopter is the Sikorsky VH-3D (Sea King) and is tasked with the Operational Test and Evaluation of US Marine Corps assault helicopters and related equipment. When the President is aboard the aircraft, the radio call sign is “Marine One”. View some interesting video clips of Marine One from You Tube.